Im sure youve heard the saying that to become successful, you need to study what successful people do and model their actions! Well if youve been following the Internet Marketing scene lately youll have noticed the growing popularity of those little exit chat agent scripts. All the big name gurus seem to be using them on all their sites. When I heard other marketers talk of the great results and extra profits these exit sales agents were generating, I knew I had to find a way for the little guy to model their success without having to make a huge investment. 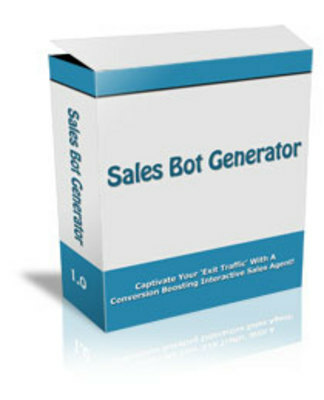 Sales Bot Generator is a simple little script you can use to set up your personal exit traffic salesmen. As soon as they get a sense someone is about to abandon your site they jump into action, giving your visitors a second chance to interact with your site and take action on your offers. Thats you done! In just 2 minutes and 50 seconds (or less) you can increase the profit potential of any webpage you want! when you start using Sales Bot Generator today! * Slash Website Abandonment - Grab your visitors attention just before they leave and intice them back into your site with a new offer. * Increase Visitor Value - Increase the dollar value of each of your customers by converting and selling more often. * Lighten Customer Support - Address some of the most common questions potential buyers have. * Motivate Potential Affiliates - Put an exit sales bot on your affiliate recruitment page reminding affiliates about competitions or special prizes you may give out for top affiliates! * Reiterate Important Bonuses - A big selling point of many offers is the bonuses that are included. Now you can make sure your visitors know the value of your bonuses by reminding them of one last time before they go. * Upsell & Cross-sell - Upsell or cross-sell related products while your customers are in buying mode. * Exit Surveys - Ask your visitors why they are leaving and youll get all the information you need to improve your offer and increase your profits!